I want to formally thank all of the participants of The Novella Challenge. I hope you had as much fun as I did! I certainly read more novellas than I would have without the challenge. And after reading all your reviews of novellas, I’ve been able to mooch a few that were highly recommended. I can’t wait to read them! I apologize for the lack of involvement after May. My wedding took way more time than I thought it would, marriage itself is taking way more time than I thought it would, and TLC Book Tours is taking way more time than I thought it would. Anyone see a pattern here? I’m not positive that I’ll do this again next year, but either way, thanks for playing! Just a quick note to tell everyone that I’m having a BLAST! I almost wish I’d finished all my novellas, because after reading people’s reviews of different books, I think I’ll be up to my eyeballs in novellas alone as far as books I want to read. 😀 Ah, it’s tough having a love affair with books. I think I’ve got everyone who’s participating listed in the sidebar. If I missed you, leave a comment or send me an email at trish dot browning at gmail dot com and I’ll add you to the list asap. You can post your reviews HERE. This is a page dedicated to the reviews of the books you’ve read. I was originally going to repost each person’s review here on this site, but between planning a wedding and working two jobs (I finished the second job April 30th), I just couldn’t keep up. So I think I’m scrapping that idea, unless someone can help me come up with a good alternative. I’ve got lots of ideas for prizes, but that will have to wait until after the wedding. So expect lots of commotion around the end of June/beginning of July. Let me know if you have any other questions, and thanks again for participating!!!! Please leave a comment on the page that is dedicated to reviews of the novellas that we read if you review any books you read for this challenge on your blog. If you do leave a comment with a link to your review, let me know if I can post it verbatim on that same page, just so people don’t have to click back and forth. I will be sure to include the link to where the review originally appeared. People are welcome to join at any time! The challenge will end on September 30, 2008. I will be doing random giveaways to those who are participating. Anywho, I think that’s about it. I’m so excited to be doing this! Read six novellas between April 2008 and September 2008. You do not need to post your choices in advance. The novella needs to be between 100 and 250 pages (because who has time to count the words in a book, Mr. Wikipedia?). Some leeway is definitely allowed (some of The Green Mile novellas by Stephen King are 96 pages, and I would hate to exclude those. I’m a lover not a hater.). Sign up! Leave a comment and I’ll add your name to the sidebar. There will be prizes (yet to be determined). I’m a competitive and loves-to-win-stuff kinda gal, so I couldn’t resist offering prizes. Please review or let people know what you’ve read. You can do that on your own blog (linking back to here) or you can post a comment here or you can post the review here. Whatever. Need not have your own blog to play. So go forth and place this button on your blog. But don’t forget to sign up here (prizes and all that). Oh, and I will be creating a separate tab so that you can see allll the novella’s we’ve come up with. Soon. Oh, so very soon. ***Edited to add: Heather had a great point: Joining this challenge will help you complete your 100 Books Challenge. And these books are quick reads. Heather is BRILLIANT! 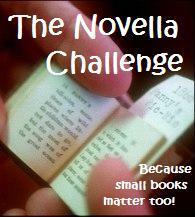 This site is dedicated to the Novella Challenge, which is hosted by trish. A novella is a narrative work of prose fiction longer than a short story but shorter than a novel. While there is some disagreement of what length defines a novella, the Science Fiction and Fantasy Writers of America Nebula Awards for science fiction define the novella as having a word count between 17,500 and 40,000….Occasionally, longer works are referred to as novellas, with some academics positing 100,000 words as the novella‒novel threshold. Sweet! I can host a challenge! Before I continue, the other part about why I was so excited about hosting a novella challenge is because I thought it was something that anyone could participate in. Work full-time? No problem! Mom with kids? No problem! Going to school and working? No problem! Working full-time, working a second job, and planning a wedding? No problem! 🙂 The chunkster challenge is something that is quickly becoming near and dear to my heart. The bigger the book, the better, and what better than a challenge to keep me motivated? But moms with kids? Oy, committing to reading chunksters might not be something they can do, but committing to read a lil ol’ novella is totally doable. Says the working-full-time-working-a-second-job-planning-a-wedding girl. Read six novellas between April 2008 and September 2008. I wanted to give everyone plenty of time to reserve/buy/mooch the books they want to read. Need not have your own blog to play. Again, I’m a lover not a hater. Seriously, let us know what you’re reading. I believe there’s a ton of untapped novellas out there just waiting for discovery. Umm…I think that’s it. I’m really nervous and really excited, all at the same time! This site is for the Novella Challenge. Come and browse around!